Easybook.com is proud to have launched Siam First Tour. 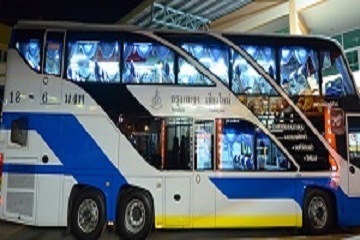 Siam First Tour Ltd. was founded in 2521, is one of the leading air-conditioned bus services between Bangkok and other provinces in the north. The company focuses on providing excellent service. And safety of travel is important. All passenger cars have been designed with safety as. We have developed a seat For convenience to customers throughout the journey. We use technology to send data via satellite (GPS) and the black box to monitor and track the vehicle. And to ensure the safety of all passenger flights. More importantly, every driver. Have been trained to recognize the safety of driving. Reception and main missions is to provide passenger car. To get comfortable To relax tight throughout the journey. And be ready to start the day refreshed when the car reaches the destination. Passenger satisfaction is our pride.